Description of "Alkalize and Oxygenate your body (eBook)"
There is many alternative ways to treat or prevent heart disease, Diabetes, Kidney disease, cancer but this is one of the most economical methods available for everyone today. 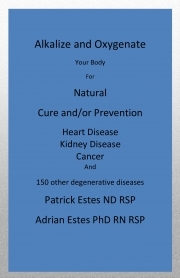 Dr. Patrick Estes is a American trained Naturopath doctor who only became a doctor after watching his mother die of cancer and seeing that the western medicine did not good and put his mother through a lot of pain. Dr. Patrick was not able to help his mother but has helped many other people in his practice. Reviews of "Alkalize and Oxygenate your body (eBook)"